Authorities say a couple in California incorporated some cutting-edge tech into their drug dealing operation—only to discover that a whirring machine in the sky may not be more discreet than a person walking down the street. 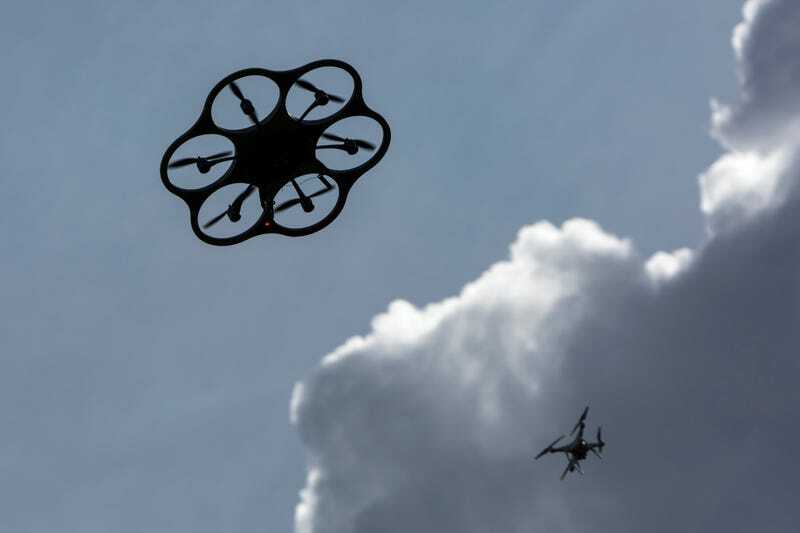 Last week, 39-year-old Benjamin Baldassarre and 31-year-old Ashley Carroll were arrested in Riverside, California for allegedly selling illegal drugs using a drone. They were also charged with child endangerment after police discovered there was a 9-year-old girl living at their home. According to a Facebook post by the Riverside Police Department, narcotics officers were surveilling the couple’s neighborhood “when they observed a drone leave the rear yard of residence” which then “flew to a nearby parking lot and dropped a small package of narcotics which were recovered by awaiting customers.” To pay for the drugs, “customers would then drive by the couple’s home and throw their payments on the lawn,” the Associated Press reports. I’m no contraband-smuggling expert, but it seems like a missed opportunity here to not put the money in the drone. It’s not difficult to grasp the logic behind offloading drug-smuggling to a machine: anonymity, baby. But a cute hunk of metal purring through the sky is still not totally inconspicuous, especially if it regularly follows the same path. Also not inconspicuous: people hurling money at the front of your house. Nevertheless, people continue to incorporate tiny flying machines into their smuggling operations. Often it’s to reach inaccessible places, such as across borders and into prisons. While millions of drones have been manufactured in 2017 alone, it’s still a spectacle to see the little dudes up there. And until our precious sky is crowded with hardware, the aerial machines might not be your best bet at avoiding suspicion.